Welcome to the media resource page for 49th Shelf. This page has all of the resources you might need to write about or review 49th Shelf. If you're looking for something that's not on this page or you have any questions, contact Craig Riggs, Project Manager at craig@49thShelf.com. 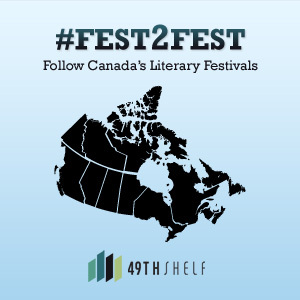 Think of as a repository of Canadian books by authors both world-renowned and up-and-coming, writing in every genre. But not just a repository: 49th Shelf is also a community of avid readers who share the books on the site by making reading lists and book recommendations. And, 49th Shelf hosts a regular blog where we highlight new and intriguing books for readers to discover. 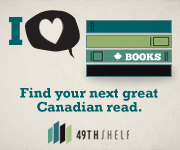 On 49th Shelf, you’ll find books you’ll never forget, meet people whose lists and reviews you’ll admire, and learn more about the authors who intrigue you. Craig Riggs is a book industry consultant. He tries to stay on top of the dramatic changes in technology and sales channels that are reshaping the industry, and occasionally manages to do so. Kiley Turner is a herder of cows, content, and occasionally people. She runs 49th Shelf's Twitter convo and runs several regular 49th Shelf series such as The Recommend. Kiley partners with Craig Riggs in Turner-Riggs Workspace. Kerry Clare is an avid reader, writer, and library-patron, and runs the popular literary blog Pickle Me This. Julie Booker is the author of the acclaimed short story collection, Up Up Up, and our resident children's librarian columnist. A man of many trades, Rob (author, bookseller, book reviewer) is heading up our new series, Shelf Talkers—a recommendation-based project with Canada's indie booksellers. Sean Cranbury is a writer, broadcaster, and digital media creator whose enthusiasms and energy for books and life in general are legendary. With his creation, Books on the Radio, he mans our audio interview series with authors, The Interruption. Mugo specializes in high traffic, big content, high turnover sites and built 49th Shelf from the server on up. Lift specializes in designing interactions with websites, mobile applications and brand experiences. Along with developing the brand program for 49th Shelf, the Lift team did the interface and interaction design for the entire site. 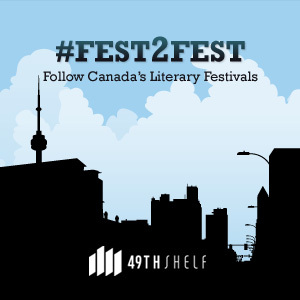 49th Shelf is produced by the Association of Canadian Publishers in association with the Canadian Publishers' Council, and with financial support from the Department of Canadian Heritage and the Ontario Media Development Corporation and a lead sponsorship from Amazon.ca. through the Canada Book Fund (CBF) for this project. on behalf of the Ministry of Tourism and Culture.